While Tesla acquired SolarCity over 5 months ago, it focused on keeping “business as usual” and it only recently started absorbing the solar installer more aggressively into its operations. Now we learn that the company is shutting down its door-to-door solar sales operations, which has over 1,000 salespeople, in order to integrate the solar offering into Tesla’s own sale channels, mainly its stores and online. There have been a lot of changes at the executive levels as SolarCity’s leadership took different roles within Tesla and some were let go. SolarCity’s workforce was reduced by about 20% in 2016 during the acquisition of the company. Now they are turning to the sales channels. The company recently launched an updated version of its ‘Tesla Energy’ section on its website to include not only its energy storage solutions but also new solar panels and solar roof tile products. Customers can order or request a quote directly from Tesla’s website and that’s apparently generating enough lead for Tesla not to have to continue its door-to-door model. Furthermore, Tesla is also preparing to integrate its solar products into its stores in order to profit from its high foot traffic locations. 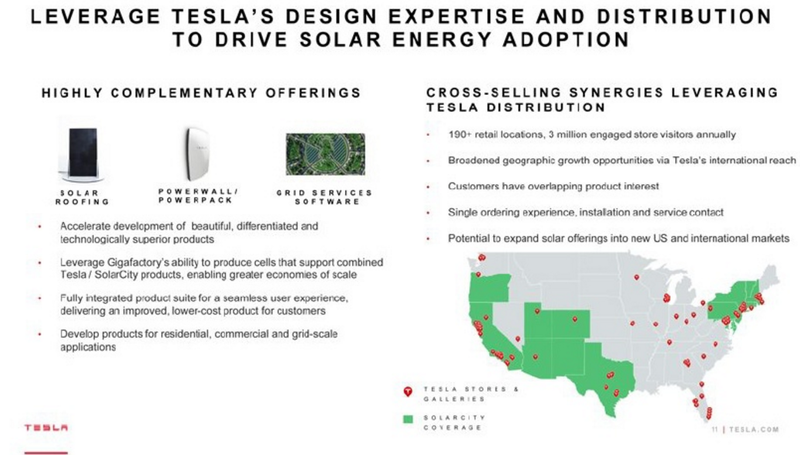 The integration of SolarCity’s operations in Tesla’s distribution network was presented as a central part of the logic behind the acquisition since Tesla has a lot of retail locations in SolarCity’s markets. Tesla’s own solar products, both solar tiles and panels, are still a few months away from production, but the company keeps installing solar projects under SolarCity’s usual business model. We should have a much better idea of Tesla’s plan for the commercialization of its own products relatively soon. You want to save money on electricity with solar power for your home or business. We suggest getting quotes from more than one installer to make sure you get the best energy solution for your place. UnderstandSolar is a great free service to link you to top-rated solar installers in your region for personalized solar estimates for free.